As regular readers have probably already gleaned, Kat has an amazingly open mind (and mouth) when it comes to solid foods. 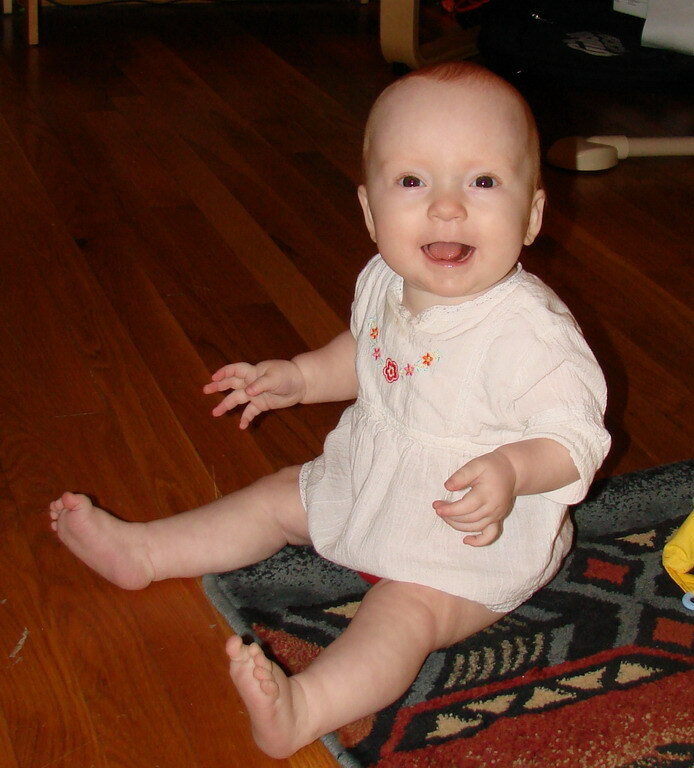 I did try, sort of, to introduce the foods suggested by typical American baby books and pediatricians to Kat: rice cereal, bananas, and other bland fare, but she just really didn’t much care for them. I am happy to report that some American pediatricians are coming around on the issue of feeding babies spicy foods. Here is a great article pointing out that a lot of the “baby food rules” that we American parents have been fed all these years are not based on science, but rather guesswork and cultural bias and may not only be wrong but somewhat harmful. I wondered about that myself when I first fed Kat rice cereal. It wasn’t exactly what one could call a whole grain–and since adults aren’t suppose to eat such highly refined grains, why are they so good for babies? Foods like that which are basically pure starch do have as high a glycemic level in the body as sugar, so I was skeptical. But, I did give it to her, oh, about twice–mainly because she really didn’t much like it. So, Kat has been eating curries: Indian, Thai, Sri Lankan, and other spicy dishes from China to Mexico and all points in between second hand since she was conceived. And she seems to be fine. As you can see from the photo above, she is growing like a weed, and has started building some nice long (and strong) legs. And she is healthy and happy. 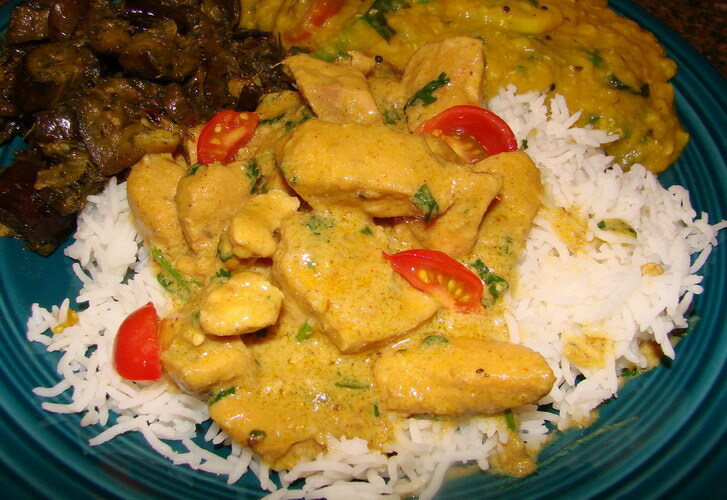 And she still really doeasn’t care for bland food, so now that she is able to eat meats, I decided to make some chicken curry she could enjoy with us–essentially baby-safe curry. What does baby-safe curry consist of? Well, I tend to use less chilies than I usually do, because Kat hasn’t caught up with us when it comes to the truly hot stuff. I don’t like to use dairy in her curries, though yogurt would be fine, so I tend to make them based on coconut milk. Which is fine–the fats in coconut milk are reputedly good for babies, being as it is very digestible. I also tend to use a good amount of very browned onions, garlic and ginger, which I have ground to a paste, in her curries: not only do they add flavor and color, they add healthy nutrients as well. The sulfur compounds in onions and garlic are quite healthy and have antibiotic properties, and the ginger helps aid digestion. 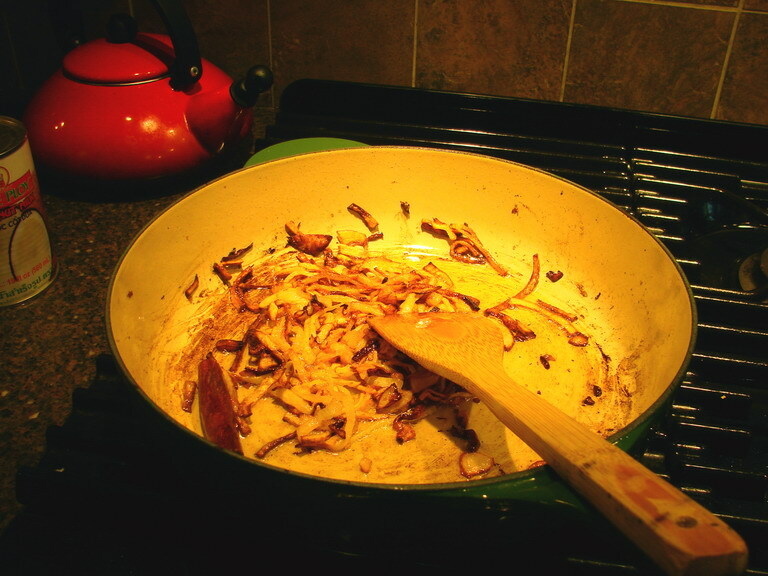 I think it is best avoid tree nuts (and oils made from them–in this curry I used the cream from the coconut milk as cooking oil, but I could have used canola oil, too, or ghee), peanuts, milk or cream and other highly allergenic substances, but everything else is fair game. That means no korma for Kat for a while, but there are plenty of other curries, based on coconut milk, tomatoes, or tamarind, that she can have. The spices I like to use for Kat include cinnamon, fennel, cloves, coriander seeds, a tiny bit of black pepper, green cardamom pods and a little bit of fenugreek seeds. I carefully grind them all to a powder, and mix them with the pureed browned onions, ginger and garlic, so that there are no lumps in the curry she could choke on. All of these spices have health-improving qualities, and they all tend to have a gentle, sweet flavor profile, especially when combined carefully together. The pepper and fenugreek are the exceptions, and their bite and slight bitterness add depth to the masala. The mixture comes out quite flavorful–but not overpoweringly hot. A curry flavored with this masala is wonderfully fragrant, and gentle with a nurturing quality that I quite like. Finally–I do use a bit of dried cayenne chile, some paprika and turmeric, all fully ground into a powder, to add the final flavoring and color to the curry. I don’t like my curries to be technicolor productions, but I do like them to have some appetizing color, and the turmeric and paprika take care of that, while the turmeric also adds its own antiseptic qualities, and the chile adds zing. That is all. I think that my feelings on making curries for a baby are this: whatever the baby likes, use it. Go easy on the spices–but don’t be afraid to use them, especially if you have been eating them all through pregnancy and nursing. Your baby is probably already used to tasting them, and will note their lack if you restrain yourself too much. Just make sure to grind your spices well, and make certain that they are all cooked carefully before the baby eats them. Raw spices are awfully hard on any digestive system. If by chance you make the curry too strong, you can always add more yogurt or coconut milk to tone it down a bit. Whatever meat you use, if you give your baby meat, make certain it is fully cooked, and can be ground into a puree for the wee toothless ones. I used chicken breasts from locally raised organic free-range chickens, and while these birds were well-exercised and the meat was firm and somewhat tough (and very tasty) it ground up perfectly fine after it was cooked in our Sumeet grinder. Of course, we folks with full dentition ate ours in chunks and chewed it, but it was nice to make one dinner for all of us. All I had to do was grind up Kat’s portions and we were all together at the table eating the very same meal. And Kat loved it–she felt like she was part of the action, and she didn’t feel like she had to cadge food off my plate, once she found out we were all eating the very same thing. I loved it because I didn’t have to make two meals, and because I could grind up extra and freeze it for days when we wanted to eat something inappropriate for Kat, like something with seafood or tree nuts or the like. And Morganna liked it because she got to ask me if baby curry is made from real babies. It makes her feel a bit like Wednesday Addams when she says things like that. Scrape about 4 tablespoons of coconut cream off the top of the can of coconut milk. Melt it in a heavy-bottomed deep pan over medium heat. Add onion slices, and sprinkle with salt. Add cinnamon stick, and cook, stirring continually until the onions are medium brown. Add the ginger and garlic and keep cooking, stirring, until the onions are dark reddish brown and fragrant. Scrape the contents of the pan, including half the cinnamon stick (discard the other half), into a spice grinder and add other spices. Grind all into a thick, dark reddish brown paste. Heat the rest of the coconut cream in the pan until it melts. Brown the chicken cubes well. When they are half browned and half still pink, add the masala paste, and cook, stirring, until the chicken is brown and the spice paste is fragrant. Add the rest of the coconut milk, and stir well. Turn the heat down and simmer until the chicken is completely cooked through. Add salt to taste, and stir in cilantro leaves and cherry tomatoes just before serving. For a baby, puree the chicken and sauce together and thin with a little bit of coconut milk or water before serving. This information is quite surprising. But thinking back, neither my mom or my aunts never cut down on spices when they had babies. They only restricted certain fruits. Tiny little baby feet alert!!! It’s refreshing, to say the least, to see others here in the United States catching on to the ‘if you ate it in pregnancy, they will have a taste for it in their young years’ philosophy and furthermore, not resorting to bitter, gross, plain, unseasoned vegetables. My brother and sister – age 10 and 8, respectively – have a very low tolerance for heat in food after being fed the typical bland diet. My son, age 2, on the other hand eats whatever I make and gorges on spicy salsas, chili and other flavorful dishes. Why? I think it’s because I ate spicy foods like that all through pregnancy and when he began eating, I didn’t shy away from adding flavor to his homemade baby foods. And soon, he was just eating what we ate. Thanks for the yummy recipe and great tips. I struggled so much with baby-izing food for my son (to avoid things like fish, berries, nuts, etc until he was 1). This will definitely come in handy with my daughter next year . . . I expect she will follow suit with my son. your beaming baby never fails to bring a smile to my face. she is just precious. We have 8 kids. I never started them on solids until, as I was holding them in my lap during a meal, they began to pick from my plate. At that point they got what everyone else was eating, ground in a baby food grinder if necessary. I have 8 kids with adventurous palates and while they may be fussy over certain things they dislike they are not, as a whole, fussy eaters. I think it is wonderful that you are introducing her to such a wealth of flavors. Just think what a rich culinary life she will have … no fast food mush for this sweetie. I know that my mum fed me and my brother what they ate, just ground up. To be fair this wasn’t very spicy because it was 35 years ago and they didn’t really eat curries then – but it almost certainly was one of the reasons that neither of us are picky eaters. The transmission through breast milk is also well know by my family – mum eating a chocolate led to the discovery that I’m allergic to it – I errupted in hives apparently. I agree with almost everything you posted and was glad to see the link to that article. However, I think by avoiding the “highly allergenic” foods you are still buying into Western scare mythology about what to feed babies. The whole point of the article is that unless you have allergies in your family, there is no good, substantiated, scientific reason to avoid tree nuts and other highly allergenic substances either (after 6 months). Maybe you have food allergies, but otherwise I feel like you are buying into the parts of the “mythology” that scare you and ignoring those that don’t. Actually, Laura, I do have food allergies myself, and Kat has shown some propensity for them herself. We were feeding her strawberries for a while, but she started having hives after eating them. I used to be allergic to tomatoes–and when she eats fresh ones and the juice gets on her face, she breaks out–just like I used to. And while I was pregnant with her, I developed a nasty allergy to black pepper. Besides–we don’t exactly live in a seafood prevalent area here in SE Ohio, so I am not worried about it. But once she is a year old, I will be much more likely to let her have a cream-based curry. On the other hand, she likes the coconut milk ones so much…oh, we will see. Right now we are having fun just watching what she will eat. She loves eggplant and last night tasted olives and liked them better than the first time. And a couple of nights ago, she had puttanesca and loved it–which led me to believe that she would probably grow to like olives soon enough. Since you have food allergies, it is a whole different ball of wax, I agree. I am glad you said so though, because I see so much hysteria over food allergies when there is no scientific data to support it, and it frustrates me since I get judgmental looks from other moms since I feed my kids nuts, etc. But anyway, thanks for clarifying. And I am always glad to see people encouraging more adventurous eating for babies and kids. Seems like people often say that what the mother eats the baby will like. But I think the causality is not always that clear. My mom loves chocolate, but couldn’t eat it when she was pregnant with me. I don’t like chocolate now — so is that because she didn’t eat it, or did she find herself unable to eat it because I (even as a fetus!) didn’t like it? I don’t hate chocolate and am not allergic to it, I just can’t enjoy it in high concentration. It’s a funny result. I am so glad others are coming to this viewpoint. By the time we had number three we didn’t have time to mess with the precautions of one food at a time for a week stuff. The only thing I found I couldn’t eat while I was pregnant/nursing was broccoli and cauliflower. Normally I love them, but during that time they gave me (and the babes) terrible gas. Now we all eat them just fine. I am all for introducing foods one at a time, but that doesn’t take much time really, and breastfed babies don’t shy away from flavors (texture is the only real issue and easily solved with a food processor). My third never ate baby food – refused it – tried to eat off his brothers plates from the time he figured out how to wave his little arms – he still eats most anything. My middle one is picky – a texture thing, no slimy stuff like mushrooms and olives. Well, more for the rest of us. And thanks for the mild curry recipe. I was just thinking of hunting one down to introduce my kids to more Asian/Indian cooking (very middle American fare here, but healthy). And indeed that little darlin of yours is a cutie! Barbara, I wish I had followed your system when my boy was starting on foods. I was good about feeding him a variety of fruit and vegetables, but never thought to give him our food – for some reason, I just didn’t get around to it. And then all of a sudden he was stubborn and two and doesn’t want to try anything new. But I’m going to try this curry and see if I can convert him! Both his dad and I love curries and I certainly ate them while I was breastfeeding! And thank heavens for number two…gives you a chance to try again! The other day I was visiting a friend who has a two-year-old, and I think she’s following the same philosophy with him that you do — babies eat whatever grownups eat, just in different-sized pieces. He was eating what we were eating, bean salad with sweet peppers and salsa, and lemonade that had very little sugar in it. In one ear, out the other. Mine loves fresh herbs and pesto, good cheese, balsamic vinegar, dark chocolate, all kinds of things kids aren’t “supposed” to like. Keep up the good work. When my son was a toddler, his favorite food was homemade pickled beets. Before he was even talking well, he would get excited and point to them on the table from his highchair. He grew up (over 6’4″) with very few food dislikes, and a love of home cooking. I just wanted to point out that some folks in the medical field are starting to think that the typical American baby diet is the cause of the rise in ADHD and other developmental disorders. Its a diet high in refined grains (baby cereal)and fruits and veggies, which all seem healthy. But its all carbohydrates and no fats or amino acids for the brain to develop properly. I have been adding flax seed meal and coconut oil to my babies yogurt, and giving him eggs for a long time now, plus I try to give him whatever we are eating. I think I will try your recipe, I think he will love it! I have seen a photo of cute little 1 year old me being spoon-fed chili by my dad in a high chair. The curcumin that you get in curry is very healthy for you. It is a powerful cancer fighter, but what I notice most is that it clears my sinuses whenever I start eating curry. I’m just starting my 5 month old son on solids and rice just smells so bad. just made this! It smells and tastes absolutely amazing! i loved the masala, with its perfect balance of tastes – exceptional! I tweaked the curry a little to suit the tastes of two adults (by adding 5 green chilies), and changed the method slightly to make up for the lack of food processor/spice grinder (I used pestle and mortar only). Maninas, please do blog about it. I am thrilled that you really liked the recipe and had a good time making and eating it. I will look for your post soon! Made it, and blogged about it! And yes, there’s the pingback! I just stumbled on this…thank you for publishing it. you rock. and your little lady does, too! Wow! I know this thread is really old, but I just came across it searching for baby curry recipes on Google! I really want to introduce my 10 month old to spices – Lord knows she eats most other stuff. How many people does the recipe above serve?